These gluten-free, Oven Fried Pickles are not actually fried at all! Our Un-Fried pickles get baked to perfection in the oven, snubbing the deep fryer for greener pastures. Also because they don’t want to die getting dipped in scalding hot oil… they are better than that. The final product yields crunchy, oven-fried pickles that are much less heavy (yet just as delicious) as their greasy cohort. 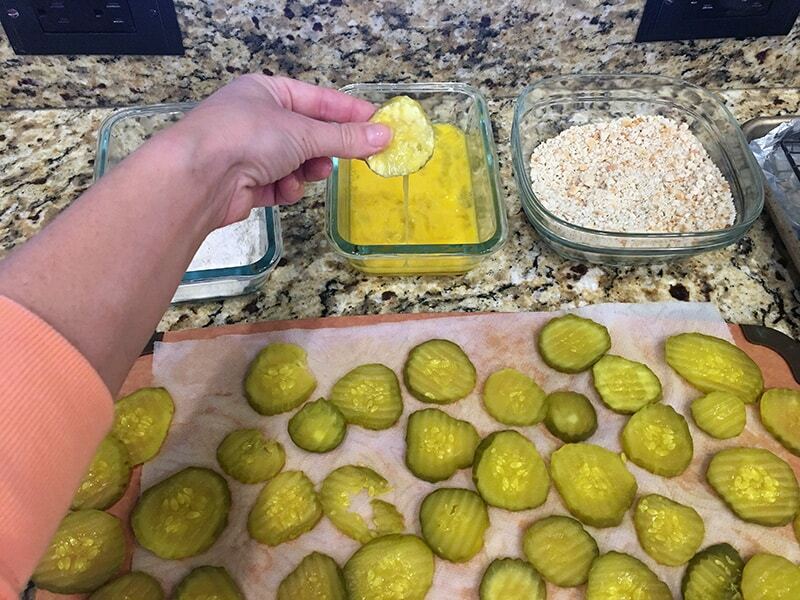 Not a drop of grease on ’em & no mess made…..very classy pickles, my my. THEN these pickles go and make you even more proud, joining forces with an Avocado-Dill aioli dipping sauce as the finishing touch. Très chic. This dreamy duo is now ready for dunking! A real class act, this combination- almost too immaculate to eat. Okay next up, they get demolished. They’re not that immaculate ok… RIP pickles. WHAT DO FRIED PICKLES TASTE LIKE? Traditionally, fried pickles have two essential elements: an irresistable crunchy layer of breading on the outside, surrounding cool, crisp and tangy pickles on the inside. Basically your taste buds get blasted, ok? Fried pickles can be made using sliced dill pickles, or with whole pickles. The batter is made using flour, which also gets packed with flavorful spices, adding even more oomph. But perhaps the best part of eating fried pickles: the DIPPING SAUCE. You don’t just eat fried pickles. That’s egregious. You dunk ’em, into a finger-licking pool of zesty sauce. Usually the sauce is a creamy, mayo based offering. It’s quite wonderful. Now for the bad news. Fried pickles taste sinful because they are; fattening and entirely unhealthy, the jerks! Being fried in unhealthy oils actually TRIPLES the caloric density. 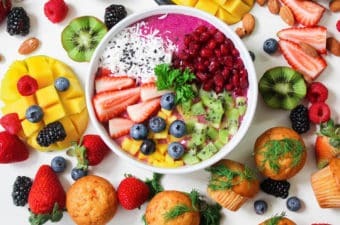 SO… how to get a similar kick in the pants, without adding to your waistline and clogging your arteries? 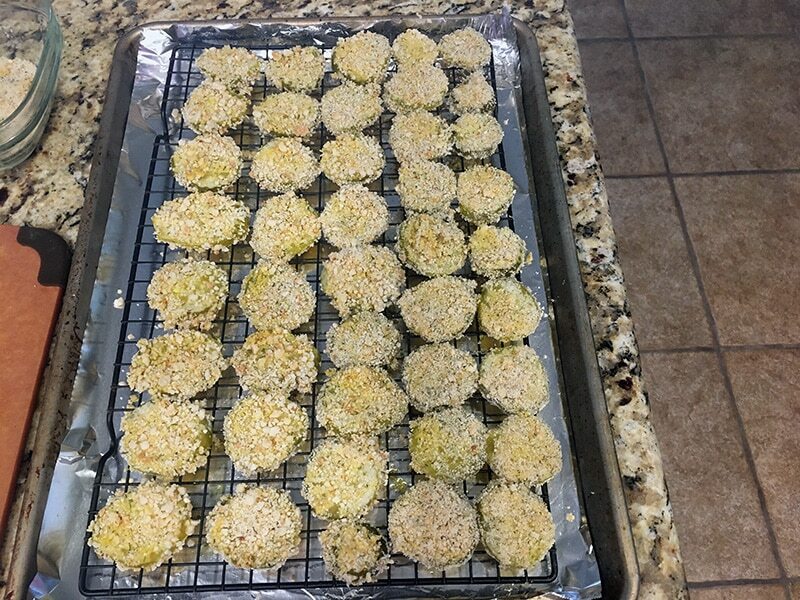 Simple: make a healthier version of fried pickles in the oven! WHAT GOES WITH FRIED PICKLES? 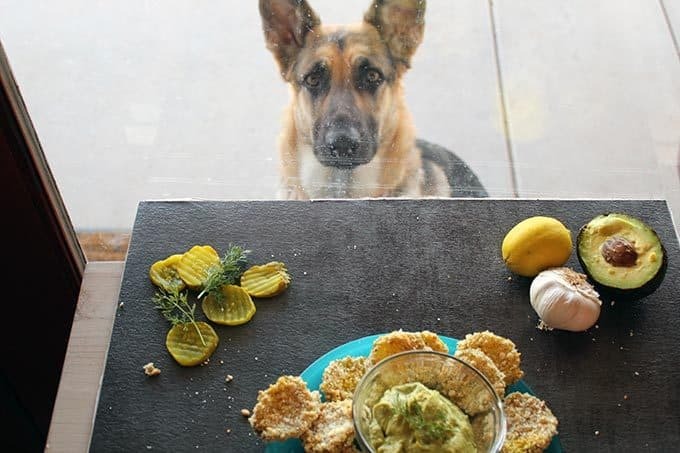 CAN DOGS EAT FRIED PICKLES? 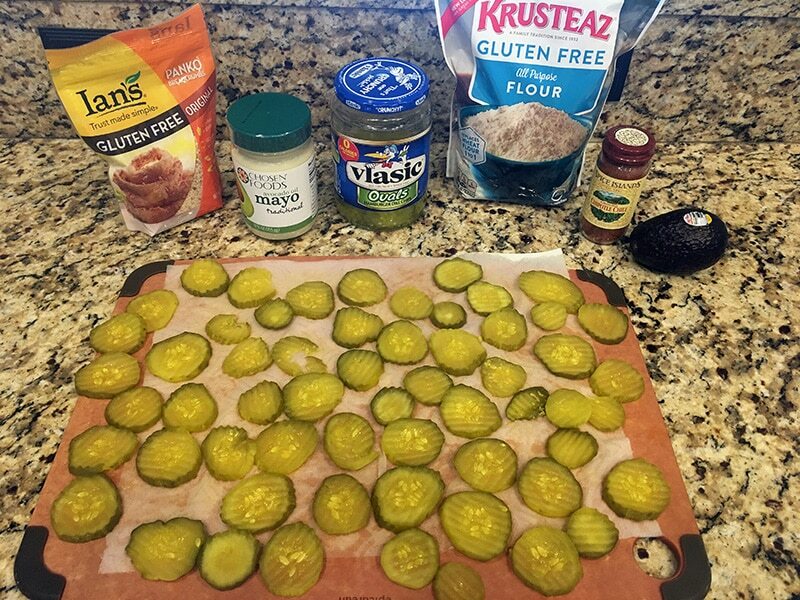 HOW TO FRY PICKLES IN THE OVEN? Well, to make oven fried pickles, first you gotta ditch the deep fryer. Also ditch the unhealthy oil (canola oil is so last century). And finally, skip the white flour (gluten-free flour will be filling in). 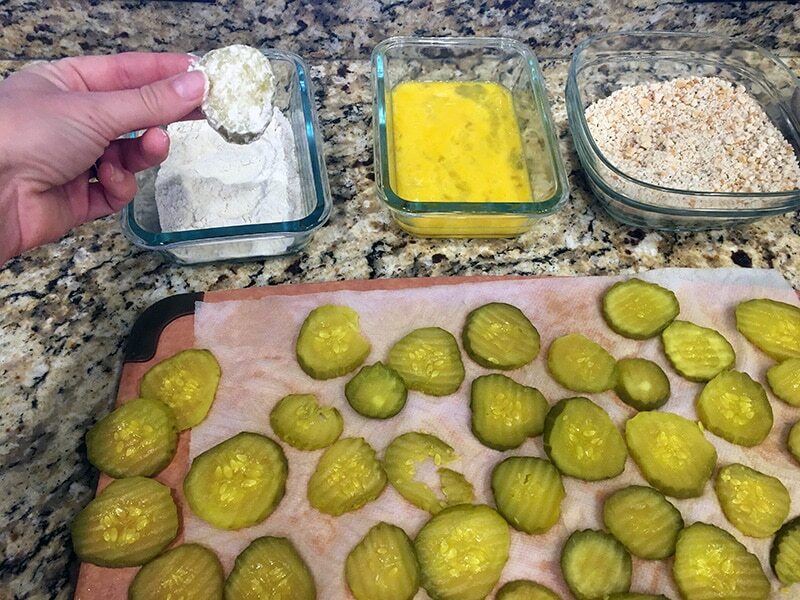 From there, simply coat your pickles in the batter, place on a wire rack, and bake to perfection! While the pickles bake in the oven, prepare your dipping sauce. You can make whatever flavor sauce you’d like, but typically something creamy really works well to bring everything together. 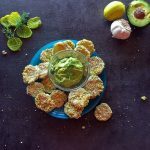 We went with an avocado-dill ‘aioli’ style dipping sauce here, which is included in this recipe. We have included a few photos of the prep in this recipe as well. 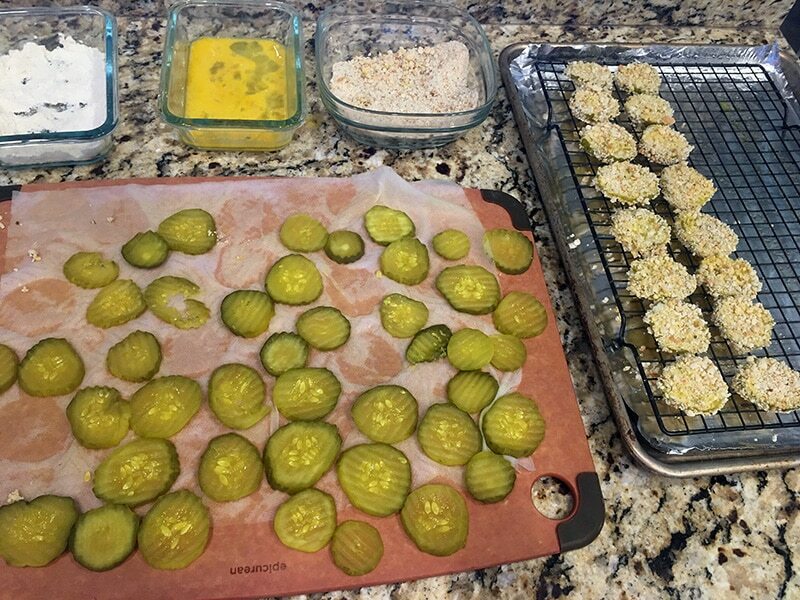 Check out the steps (& photos) for making oven fried pickles below! STEP 1. Assemble ingredients / pickle workstation LIKE A BOSS. Most crucially, drain & set pickles aside on paper towels to dry off. Wet pickles straight from the jar are NOT gonna work here, so give yourself a head start. Also, pre-heat the oven now. Then set up your pickle assembly line. You’ll need 3 shallow dishes, arranged in order Left-Right (GF-flour, egg wash, GF-breadcrumbs), plus a baking sheet lined with foil & fitted with a wire rack. 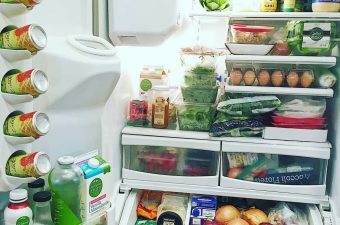 Note: I forgot to take a photo of the “pickle station” before starting, soooo here’s a picture of it by the time I remembered that I forgot. STEP 6: Place pickles in oven to bake. 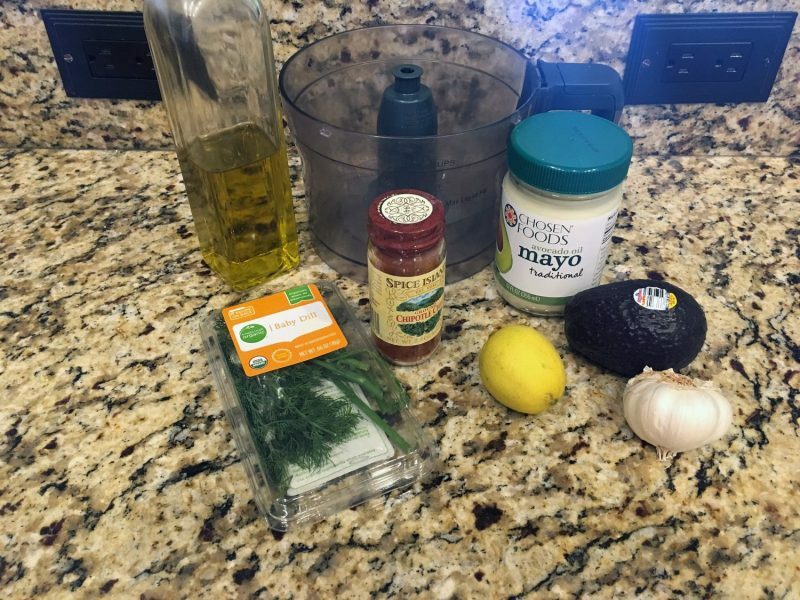 Meanwhile, prepare the avocado-dill aioli, using a food processor or blender. So much yes right here! 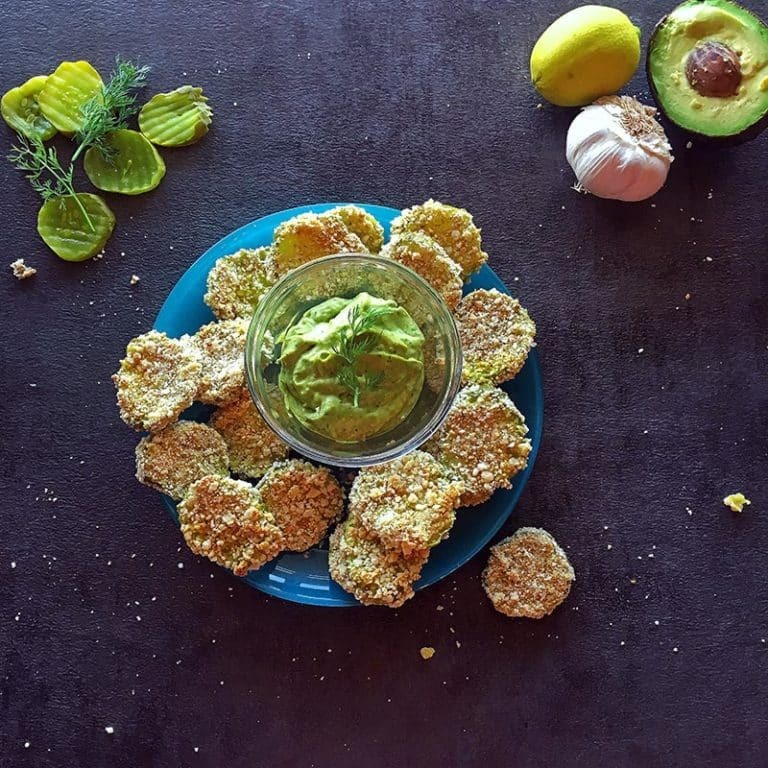 I love fried pickles but usually have to resist temptation… this recipe is the perfect healthy substitute thank you!